Bodice – not sure if it needs to be bigger. What do you think? Anyhow, the dress was really simple to assemble and came together in just a few hours. It would be even quicker without the pockets, and even though I do like to have pockets, I don’t really like them on this dress. They are in-seam pockets, and the skirt isn’t gathered or anything at the waist, so it seems to me that the pockets add a bit of bulk to the hip area, which quite frankly I could do without!! I used my overlocker for pretty much the entire project, except the topstitching of course. I love how neat it looks and how fast it is to sew like that! I love how it always feels so easy and comfortable to wear knits, too. I’m already planning my next one, when I can put my stripe matching to the test. I just have to come to some sort of decision about sizing. 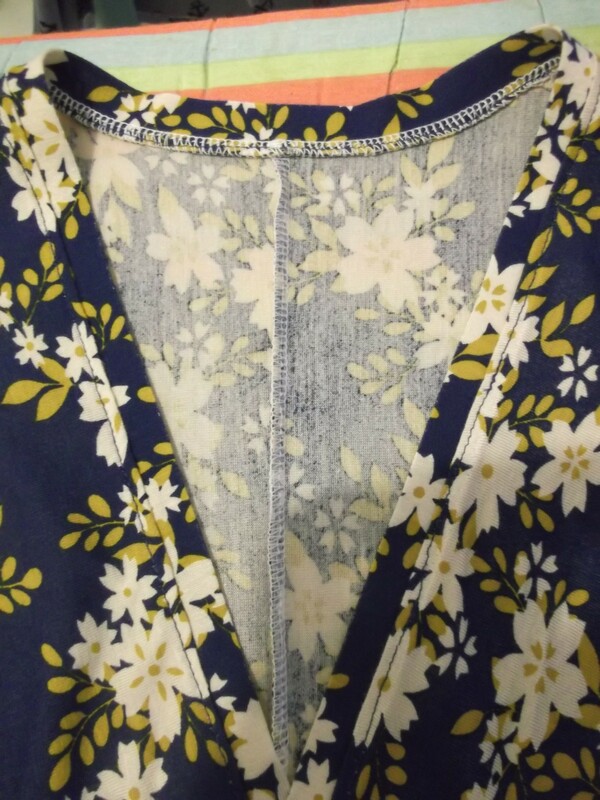 Overlocked seams, and topstitching around the neckline. Reason 1: Good for twirling in. 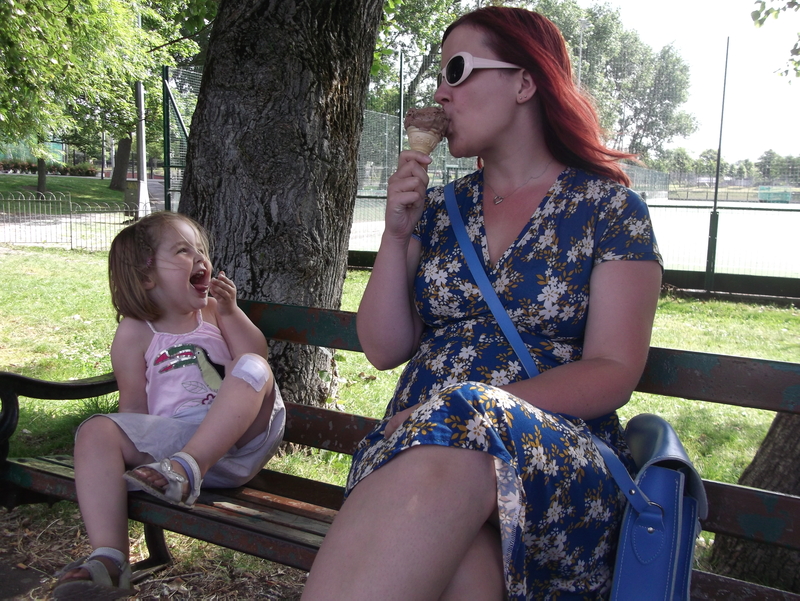 Reason 2: It’s a nice dress to wear when eating chocolate ice cream at the park. Reason 3: It holds up well on the swing. 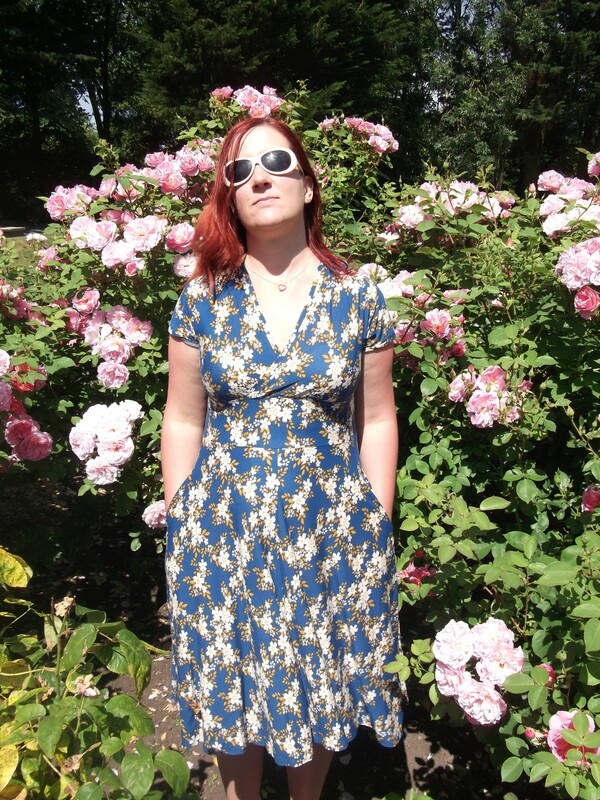 Reason 4: It’s good for moody posing by rose bushes, with hands in pockets. So what do you think? Does the sizing look right to you? Advice greatly appreciated! (By the way – I know a few other bloggers bought the same jersey at the Birmingham meet up, so let me just warn you that the fabric dye really runs! I pre-washed my fabric at 40 degrees, but it still managed to dye my white bra blue when I wore it. Luckily, the dress itself doesn’t seem to have faded). ← Completed Project: Three Sewaholic Pendrells! Ooh very pretty! This is definitely on my ‘to sew’ list. I love your Tiramisu! You look great! From the photos I think the size of the bodice looks fine but you’re the one wearing it so definitely keep playing until you’re happy. I wear the same bra size as you do and I cut the 35D as well. If you do go for a larger bodice size I’d recommend you go up in the front but keep the back the same size as you used on this Tira. Or you could also do the FBA. I’m pretty sure Steph has a tutorial on her site. Looks like a great fit to me, and I love the fabric. Thank you for the tip about the pockets – I think I’ll leave them off. The ice cream pic is my favourite ! Thank you. Yes, I’m definitely going to omit them in future versions too. It’s kind of a weird idea anyway to have knit pockets, as I’d worry that anything I put in them would just stretch the dress and put strain on the side seams – not a good look! Do you have a link to photos? Would love to see! The sizing looks spot on to me, you look fab! I never did go and get that fabric you know, so I’m very jealous! 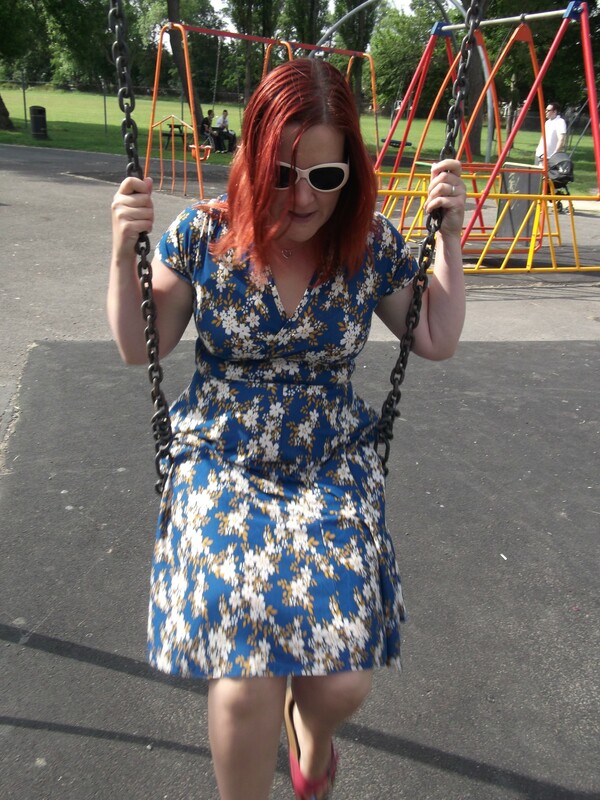 It’s a lovely little summer dress. Thanks! You’ll have to go back, it is very pretty fabric! It looks a really good fit and it seems to move around well with you on your activities in the park. If it didn’t feel tight then, I guess it’s a perfect fit. I love the design – very flattering. 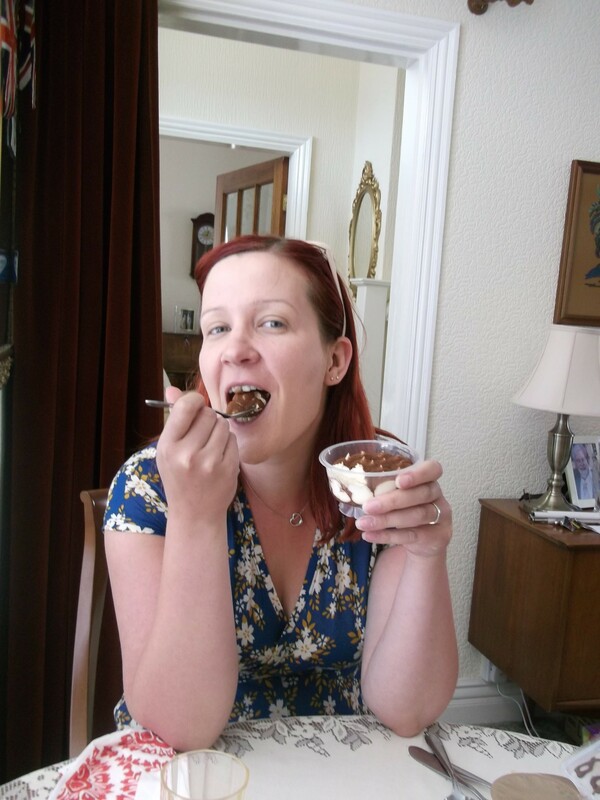 Coincidentally, I had a great Tiramisu yesterday at our quilting group (someone’s birthday!) and she said it’s very quick and simple so she’ll be handing out the recipe details soon. I’ll send it on if you’d like it. (Should be made the day before which is always handy for dinner parties.) Though too much and we all might have to let out some seams! Great dress, I think the fit looks spot on. I’ve been coveting this pattern for a while and every version I see tempts me even more – I love the “put together” feeling of wearing a dress! Dresses are awesome for that. 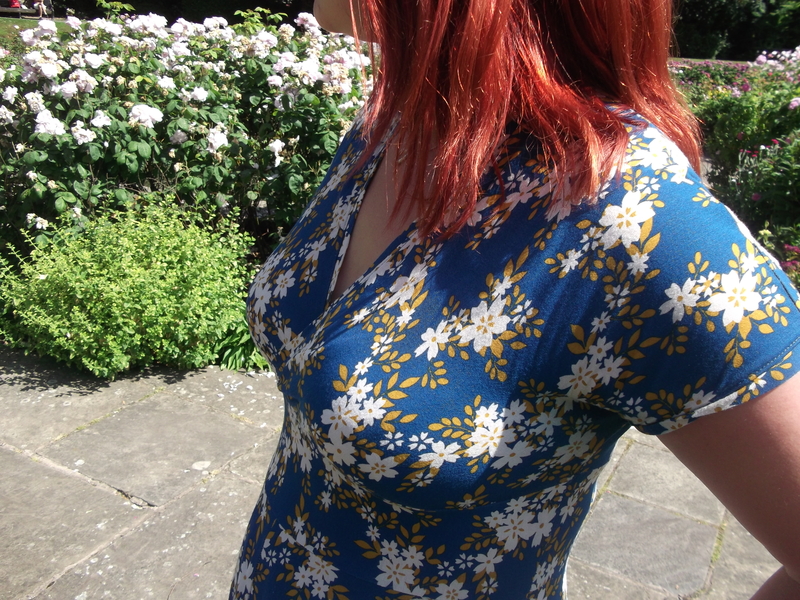 This dress is such a lovely design and so easy to sew – I heartily recommend it! Oh I love the fabric! The blue combined with the flowers looks just great on that pattern (and on your of course!). Thanks! I couldn’t resist this jersey fabric, it was just so pretty! You may well see it cropping up elsewhere on the sewing blogs as quite a few other sewists snapped some up! It looks like the perfect summer dress, the fit looks great. Oh, your tiramisu is just beautiful! 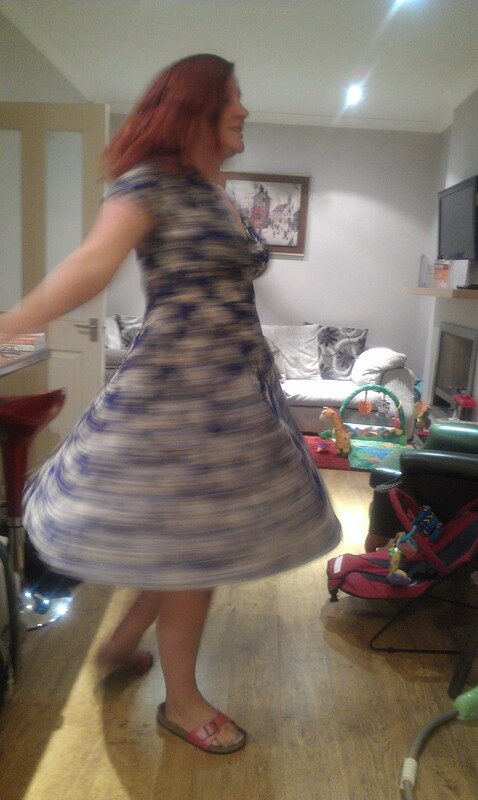 Great fabric and twirl appeal. I just made my first Cake Patterns make as well, but it is the Cabarita top, also a knit. Ooh I love the Cabarita top! I might buy that pattern at some point, too. Was it easy to make? Thanks for the link, it’s a really pretty top! Very pretty dress, the fit looks okay to me I don’t see any major pulling. Shame about the colour of the fabric rubbing but I’ve found that is really common with knits I’ve bought. Thanks. It’s the first time I’ve experienced it. I thought the prewash would sort it out! Ooh, I love it! I think the fit looks good, not too tight and not too loose. And the fabric is perfect for this pattern. Cheers for the heads up on the colour runs, I’ll remember when I finally get round to using mine. Thank you! Looking forward to seeing what you do with it! Place cooled coffee & ¼ cup of the Kahlua into a shallow dish ready for dipping the sponge fingers into. In a bowl combine mascarpone & cream & whip together well, add the rest of the Kahlua & whip. In a 19cm square dish place a thin layer of the cream mixture, just enough to cover the bottom. Dip one sponge finger at a time into the coffee mixture & place on top of the cream in the dish until covered. Spread 1/3 of cream mixture over the sponge fingers & sprinkle a small amount of the grated chocolate of this. Do layers of the dipped sponge fingers & another 1/3 of the cream then the grated chocolate until all the cream has gone. Sprinkle generously with grated chocolate & if you like you can add some chocolate curls on top. Place in fridge for at least 24 hours, this allows the sponge fingers to absorb the coffee mix & moisture from the cream mix & soften nicely. Serve & enjoy. It’s probably the extra thick double cream. I’ve not made this yet – just sampled it and passed the recipe on as I received it. I think the note was to say any other coffee liquor will do. I can’t find a reference to it either but as I have Kahlua in my pantry, that’s what I’ll be using. Hope it works out well. gorgeous dress!! I love the fabric you picked! Thanks Charlie! It was lovely to meet you on Saturday.